World Health Organization (WHO) Director-General, Dr Tedros Adhanom Ghebreyesus, has called an Emergency Committee meeting on the Ebola virus outbreak in the Democratic Republic of the Congo (DRC), which has already claimed around 130 lives. The WHO has assessed the national and regional risk of the current Ebola outbreak in DRC as "very high," although the global risk remains low and, so far, the UN's health watchdog has not called for any trade or travel restrictions to be imposed. 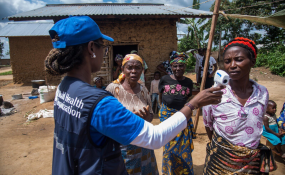 The Emergency Committee, scheduled for Wednesday at WHO headquarters in Geneva, will decide whether the outbreak constitutes a public health emergency of international concern, and what recommendations should be made to manage the spread of the disease. This outbreak, the tenth to hit the DRC over the last four decades, was declared in North Kivu Province on 1 August, this year and, based on the worsening security situation in and around the city of Beni, WHO elevated the risk from "high" to "very high" on 28 September. More than 20 civilians in Beni were killed in the incident that provoked the suspension, which came on the heels of multiple attacks in previous weeks. It's estimated by the UN that more than a million civilians under threat from armed groups, are internally-displaced in North Kivu; around 500,000 this year alone. The eastern region is close to the border with Uganda, and Rwanda. Meanwhile, the UN Children's Fund (UNICEF) reports that one month after the beginning of the school year, 80 per cent of school-aged children have returned to school in Beni and Mabalako health zones, the two epicentres of the Ebola outbreak. UNICEF has identified more than 1,500 schools in the areas affected by the epidemic.